I have to admit that when we found out our second baby was a boy, I was both really excited and incredibly nervous. How was I going to raise a son? 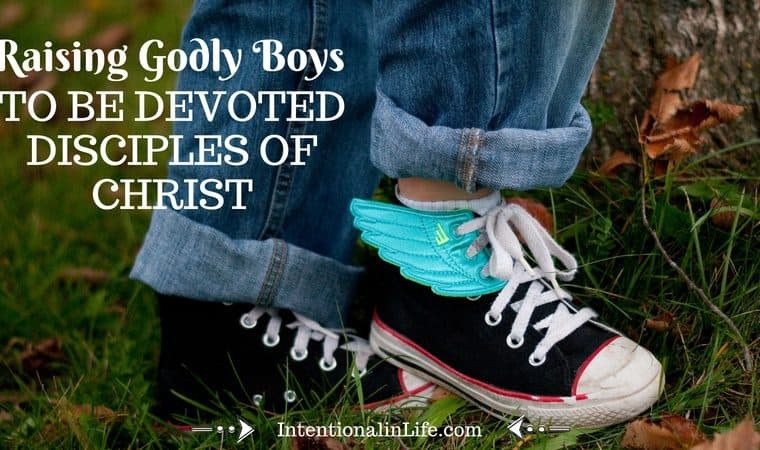 Raising up godly boys seemed foreign to me. I’m not a man and don’t think like men think! Our first child was a girl, and I understand all things, girl! But a boy? That boy of ours is now 17 months old. And while I am still really new to this being a mama of a boy role. I feel a little more at peace about it than I did back when I was just 20 weeks pregnant with him! I have gleaned insight from my husband. 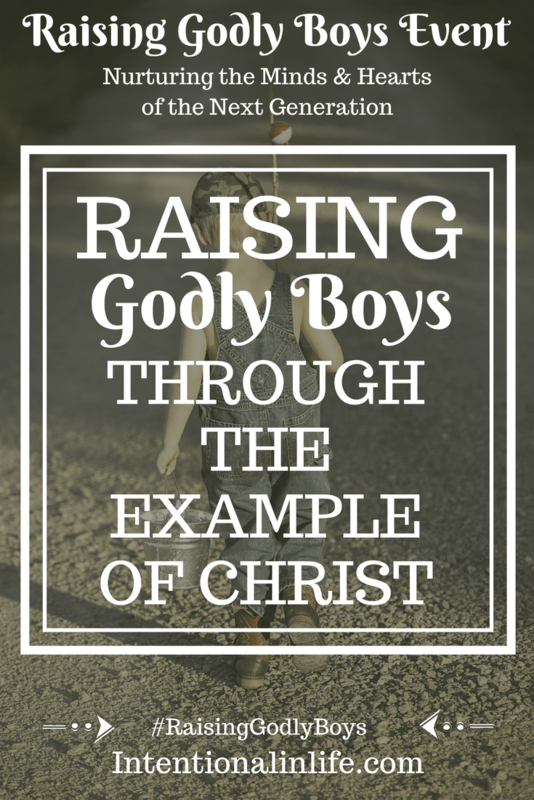 I’ve listened to a ton of awesome podcasts about raising godly boys. Not to mention read quite a few books that dealt with that topic a bit. By far, though, out of all the books and podcasts I have gleaned wisdom from, the wisdom that has equipped me the most for this new role came from my mothering hero, Sally Clarkson. 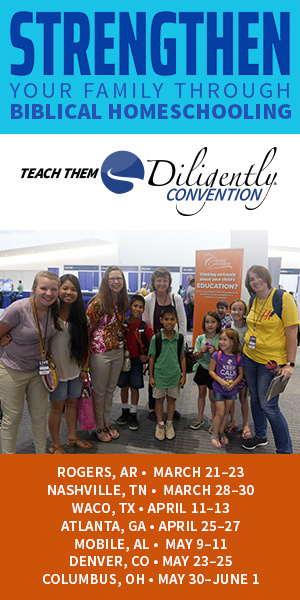 It was a lightbulb moment for me when Sally pointed out that in all aspects of parenting, Christ and the way He discipled the people around Him is our greatest example. With that truth in mind, I want us to look at 5 different principles that I see Christ implementing when it came to how He interacted with His disciples. Though this “stereotype”, if you will, does not apply to each and every man out there, it does apply to many: men (and therefore young boys) deeply crave respect. So, as you are seeking to grow in closeness with your son, be interruptible for him. When he wants to talk to you about something important to him, listen. If he asks you a question, answer it with your full attention. To not do so will come across as being disrespectful to him and that can, bit by bit, turn him off to wanting to hear from you and grow as close to you as he otherwise would. We see Christ living out this principle repeatedly throughout the Gospels. Often, He would be teaching truth to a group of people when suddenly interrupted and called elsewhere (Matthew 9:14-26). He would be spending time with just His inner circle of disciples when the multitudes would suddenly rush after Him (John 6:16-25). He would be teaching the Pharisees on important matters when suddenly many children were brought to Him (Mark 10:1-16). Each time, He showed Himself willing to be interrupted for the sake of the needs of others. 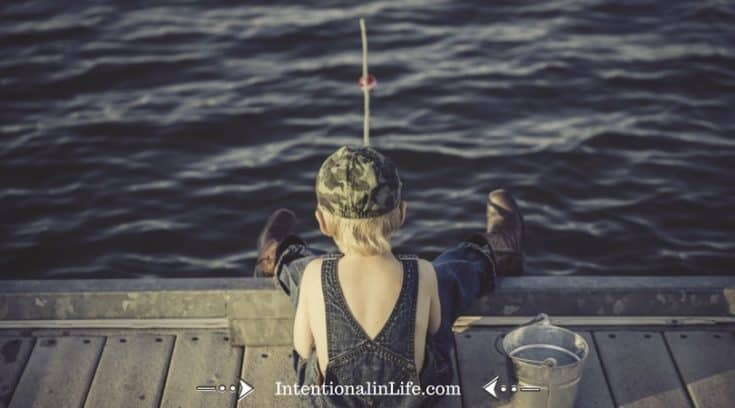 What a powerful example for us as busy moms as we are raising up godly boys! Respect How They Were Made and Their Resulting Needs and Desires. This goes back to the issue of respect that we already touched on. But I think it bears repeating here, as we look at a different aspect of parenting our boys. The fact of the matter is this: boys are different than girls. 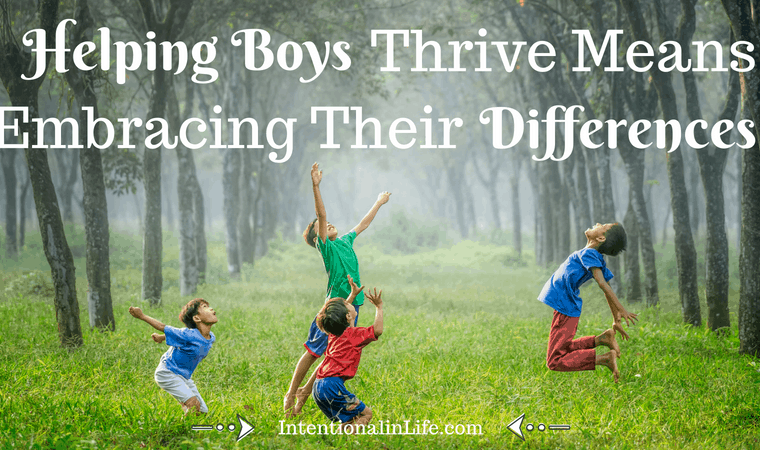 So in our efforts in raising up godly boys, we shouldn’t make the mistake of coddling them too much. Or expecting them to be interested in the things we are interested in. We also shouldn’t expect them to understand the same things that we, as females understand. Jesus exemplified this very well for us. Throughout the Gospels, He taught people using specific parables according to what they knew and would understand and what would resonate with them. Like their work, and their interests, specifically. For example, in a time and place that was very agricultural, Jesus regularly taught using parables that gardeners would understand (Matthew 13:1-9 and Luke 13:6-9). This is not to say that as a woman you have to become well versed in all things sports to raise your sons to be godly boys. 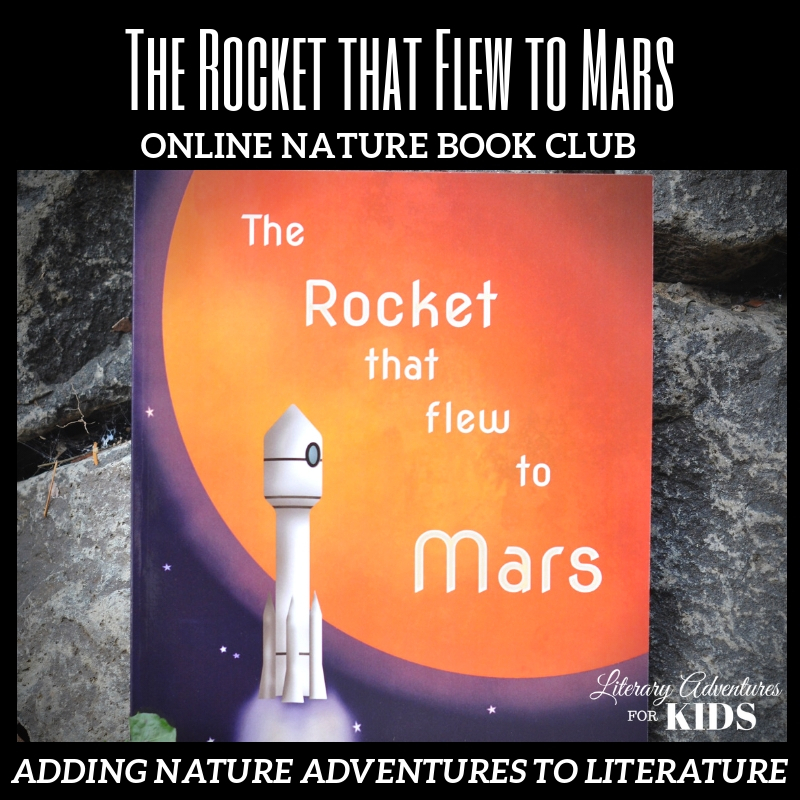 But it is to say that trying to take an interest in what interests them and harnessing that interest into various teaching moments and illustrations can go a long way towards building that kind of close relationship with your boys that you desire. Be Unwavering on Truth and Standards, But Remember that the Key is Getting to the Heart. We moms sometimes believe the lie that in order to raise godly children, our focus should be primarily on rules and regulations. But I’ve said it before and I’ll say it again – behavior modification benefits very little. What we need to be after is seeking heart transformation. 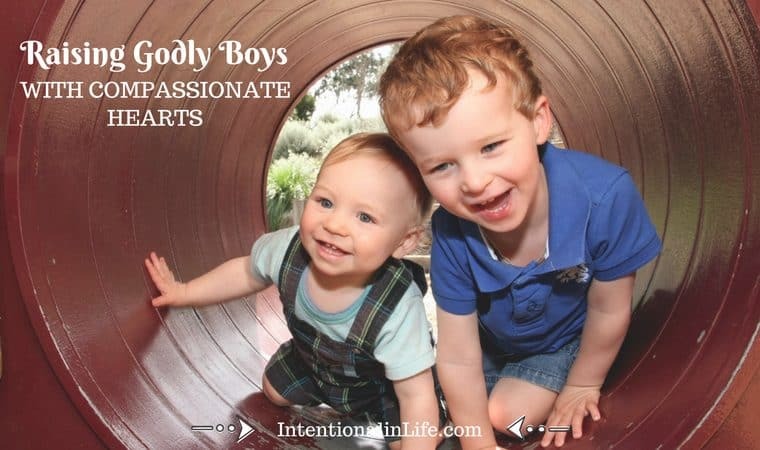 If we have the hearts of our sons, it will be far easier in raising godly boys. They will want to obey us and want to hear what we have to say. If we’re constantly beating them over the head with more rules and regulations, thinking that doing so will result in changed hearts. We are sadly mistaken and our efforts will most likely backfire. Quality time is important, even if quality time is not your son’s primary love language. Intentionally choosing to spend that special time speaks volumes about the kind of love and affection you have for him. This, again, will go a long way towards cultivating the relationship. Which will then, in turn, lead to his desiring to give you his heart and follow your ways. Christ is a prime example of this, as well. In three years of ministry, He poured out His life for people who came and sought to learn from Him. For His disciples, people in need of healing, and even those who wanted to do nothing but argue with Him. We don’t even have space here for me to include all the Scripture references for this point. Because Christ’s spending long hours with other people in order to meet their needs is literally all throughout the gospels. If you are in need of some inspiration in this area, choose one gospel and just start reading! Emphasize the Balance of Love, Mercy, Grace, and Compassion with Strength, Truth, Virtue, and Courage. In raising up godly boys, we need to be careful to not make the mistake of going to either extreme. That of turning them into either effeminate little guys or else encouraging them to be super tough, hard, macho men. Our sons need to be encouraged to strike that great balance of love and compassion with strength and courage. Christ, again, is our ultimate example. He was the epitome of grace and compassion. Christ was tough as nails when it came to courageously doing what His Father had called Him to do. And He was tough when exposing error in those who were self-righteous and Pharisaical. 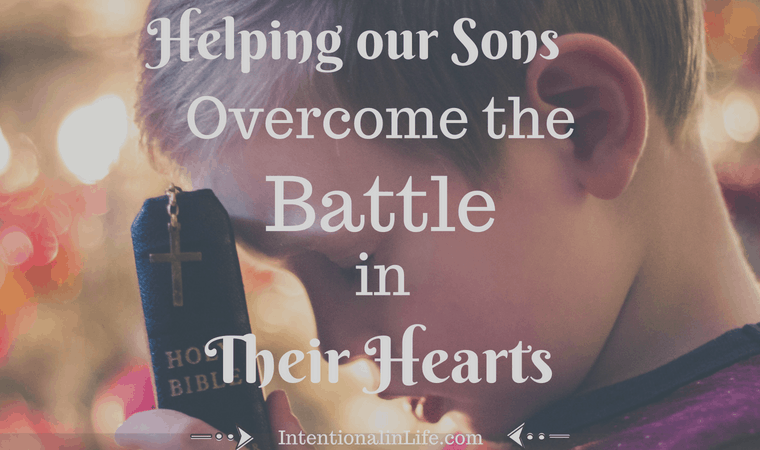 We need only to point our sons to Christ if they need an example of how to be godly men. 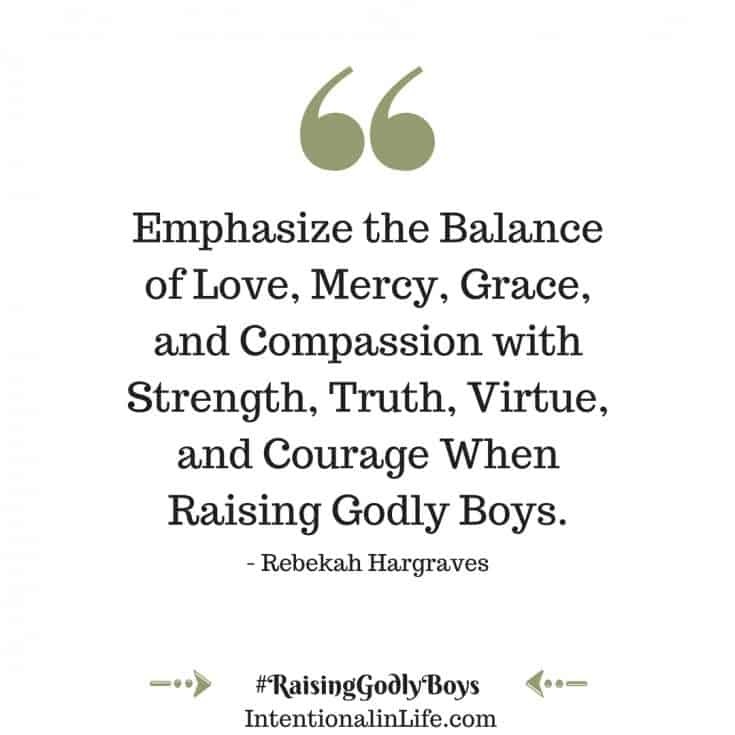 You are Not Alone in Raising Godly Boys, Mama! Sweet mama, please know that you are not alone as you seek to raise your sons to be godly men. 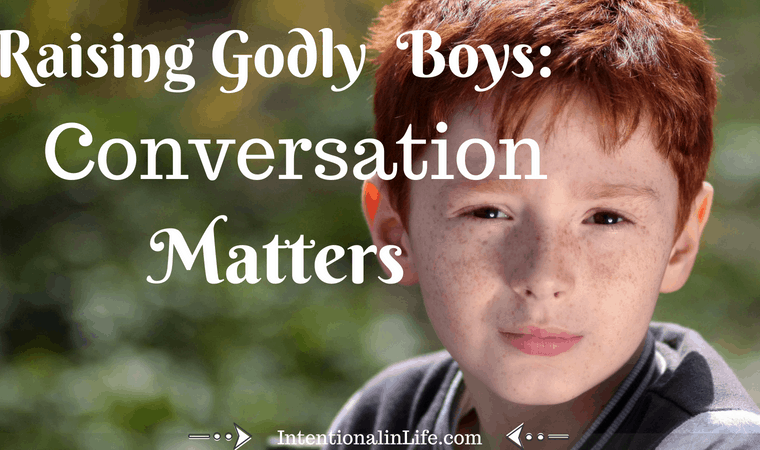 Even if you don’t know where to start with raising up godly boys or how to relate to them. Or if your husband isn’t in the picture or is simply not a hands-on, godly example to your boys. Even if being the mother of sons feels daunting, you are not alone! Ultimately, you don’t need parenting books or podcasts on raising up godly boys. You need only to pick up your Bible and start reading. Look to Christ and glean from Him all the wisdom that you could ever need as you go about raising your sons. Take heart, mama. You are not alone! One of the things I try to address with my wife is to not be afraid of taking a bit more of a firm hand with our son, James. After having our daughter, Anna, my wife’s natural tendency, understandably, is to be giddy and soft-spoken in most scenarios with our son. In some of those cases when our son, James, is misbehaving, I agree with my wife that we need to be delicate in our dealing with him. However, in most cases, our son’s behavior warrants somewhat of a more firm hand. I am more quick to give James the more firm hand that is warranted in those situations. I also think it’s important that if wives were to ever have an issue with the discipline or correction their husbands administer, that they not address it in front of the children. One of the many things that Bekah and I had to watch with Anna, was when she found out that if Daddy said: “no”, she could sneak over to Mommy and see if she said, “yes” (or vise versa). This needs to be addressed so that our children won’t grow fond of one parent over another, which would be bad for multiple reasons. 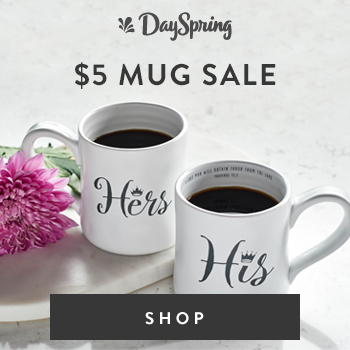 Many of the problems our society struggles with today, like “gender identity”, homosexuality, drug addiction, and various other sins, start at home. Sometimes, the lack of a father’s or mother’s positive influence in a child’s life is all it takes to send them down a dark path. These problems can also stem from having a bad relationship with either parent. Show him how to treat a woman with love and respect by treating his mother in that way. Show him how to work hard and what it means to put his family’s needs before his own. Minister to him so that he will know how to minister to his own kids one day. Show him what it’s like to live the hard life of raising a home and family. So that he will never take his future wife for granted. 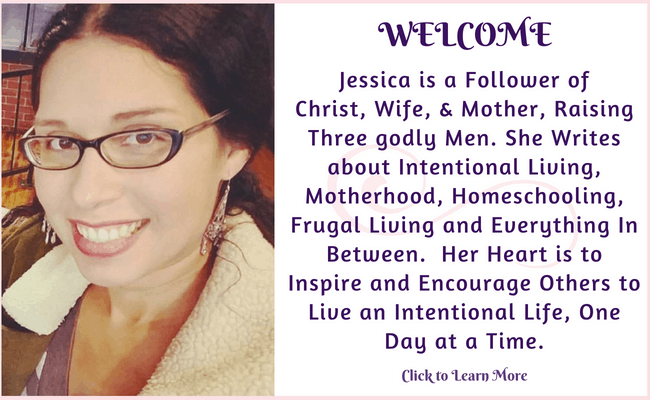 Erin of Homeschool Balance joins us for the Raising Godly Girls Event! 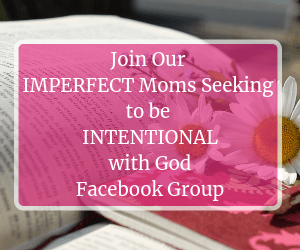 Join us today to find out both the Why and How To Teach Character When Raising Your Godly Girl + Giveaway! Get the details here! Lies Moms Believe (And How the Gospel Refutes Them!) by Rebekah Hargraves of Hargraves Home & Hearth! Be Interruptible… that is a challenge on so many levels but so important! I don’t ever want to be too busy to stop and wrestle or recognize a God moment. Great reminder!